Composed of easy-to-tear, thin paper, masking tape is a pressure sensitive tape that is primarily used in painting applications. It is used to cover areas so as to protect them from painting or over-spraying, and often for adding clean paint lines. However, its uses are not restricted to just painting. It is used in a wide range of commercial applications as well, such as warehousing, construction, marine, retail, and shipping. Residue/transfer resistance – the duration of tape’s application, and exposure to heat and sunlight will determine whether or not it will leave any residue behind. 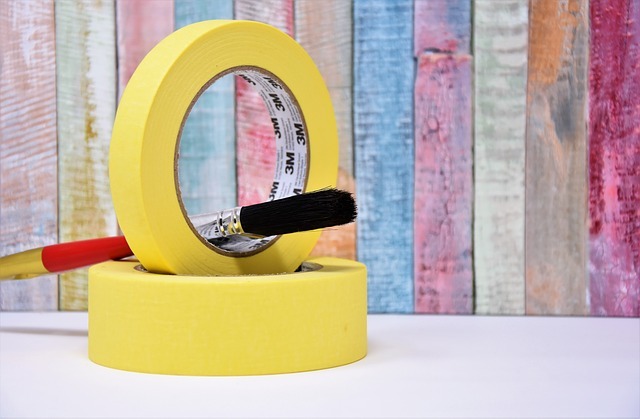 For edges and curved areas – if you want to use the tape for a curvy or edgy surface, you will need a high-grade masking tape, preferably fine line. Sharp paint edge – if you want a tape that won’t absorb the solvent through the covered area, select one that has a sharp paint line. Swift and clean removal – if you apply the tape for the recommended duration, use it under the conditions mentioned, and pick the right grade one, the masking tape will come off in one piece without leaving any remnants behind. Automotive paint jobs require a unique blend of skills and artistry. Be it complete re-spraying of a car or simple bodywork repair; it needs to be done fast and flawlessly. Moreover, handling edges is tricky and doing that without wasting paint is trickier. Masking tapes are flexible enough to follow the curves and crevices of the vehicle, allowing for flawless finishing. Plus, they have the right combination of residue-free removal and strong adhesion, which is a priority given that these jobs require speed and precision. Moreover, once the job is done, masking tape can be easily removed without leaving behind any traces. Of course, no one wants to wants to waste their time in picking up left-behind remains of the tape. Masking tape allows for a clean and fast job! In the construction industry, masking tape is used to protect window and door frames from damage. Long strips of the tape are also used to protect large glass panes from shattering due to the construction work. The reasons this tape is given preference in the construction industry over other tapes is because when removed, it does not leave behind any residue that may damage the surface. However, the masking tapes used in the construction industry are slightly different than normal ones. They are usually multi-surface performance and quick stick. Their clean removability makes them an asset in this domain. Masking tape offers instantaneous adhesion to marine surfaces, including curved facades without tearing or lifting. In addition, this tape is capable of resisting solvent-based coating which makes it ideal for marine applications. For the masking tape to work in these commercial and industry settings, it is essential that the one you select is high quality and designed for hi-grade performance. Not sure which grade masking tape is ideal for your use? Check out our website and view our complete range of products. Have questions? Give us a call at 800.442.1338, and we’ll address all your queries and concerns.